BANANAFISH Bedding - from traditional to modern Bananafish bedding has the perfect style for you and your baby. Creating an attractive baby’s room is one of the most enjoyable things you can do when bringing your newborn home. That’s why Bananafish has designed beautiful collections of baby bedding and nursery decor for every style. From traditional Grace bedding to modern Short Latte (to the right), our sets include comforters, fitted crib sheets, bumpers and dust ruffles in high quality fabrics. You can also add whimsy to your baby’s room with additional accessories: window valances, pillows, lamp shades, blankets, diaper stackers, mobiles, diaper bags and more. 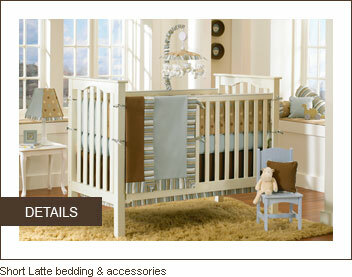 We also offer upscale brands such as Skip Hop and MiGi that offer additional ways to help you create your dream nursery. Moms love Bananafish bedding for its original designs, practicality and high quality. Many online retailers carry Bananafish bedding sets so you can easily shop from home. If you prefer your local store, please check here for retailers nearest to you.